Quad II eighty review | What Hi-Fi? Few hi-fi manufacturers have been around as long as Quad, and in its 60-plus years the company has delivered a number of landmark products. Its innovative electrostatic speakers certainly take centre stage, but the company’s valve amplifier designs from the 1950s deserve some of the limelight too. Those earlier products are a heavy influence on this Quad II-eighty valve-powered monobloc power amp. It has much of the style of the 50s version, and is built well on the whole. The II-eighty feels solid and chunky – no bad thing for a power amplifier of this price level. Take care when moving it, though: it might be relatively compact but is surprisingly heavy at around 21kg for each channel. We’re less impressed by the quality of paint finish on one of the monoblocs – the other is perfectly fine. The offending mono has a rather obvious paint blemish clearly visible on top of the transformer casing. We’re surprised that it got past Quad’s quality control. But we’re going to assume it’s a one off, as this kind of flaw is unacceptable in any product – let alone at this level. As expected in a power amplifier there’s not much to say when it comes to connectivity. As far as inputs are concerned, there’s the usual single-ended line-in and the IEC mains connector, while, this being a valve amplifier, there’s the usual choice of speaker outputs with 4- or 8ohm options. Just connect to the ones that match your speaker’s nominal impedance the closest. There’s no harm in experimenting, either. It’s not just the power amplifier’s appearance that harks back to the past; the internal circuit owes much to the original Quad II monobloc, but has been carefully upgraded where needed. Look through the protective cage and you’ll see the full complement of valves. They include a quartet of KT88s (the large ones), a pair of 6SL7s and a single 6SN7. Once fully warmed-up this amplifier produces a lot of heat, so decent ventilation is a must. The original Quad II mono produced around 15W output, but this new one is much stronger, registering 80W. That kind of output from a valve amp is good going, and means this monobloc is at home driving a wide range of speakers. Some of our listening was done with the partnering QC-twenty four preamp. This £1000 preamp is the natural companion from Quad’s range, and is a pleasant and likeable performer. Yet, partnering the Quad II-eighty with our reference Bryston BP26 preamp and McIntosh’s D100 digital preamp shows that these monoblocs are capable of far more, if fed from a more ambitious partner. The amount of volume on offer is surprising, and there’s an impressive degree of composure, dynamic ability and articulacy too, with a robust presentation built on a really assured bass performance. Not many alternatives can match that. Most valve power amplifiers we hear sound a little soft at low frequencies; not these. Whether powering speakers such as Quad’s ESL 2812s, ProAc’s D40/R or our reference ATC SCM 50 speakers these monoblocs deliver full-bodied, yet taut and punchy bass. Most good valve alternatives would need a greater amount of care with speaker matching before they could even get close to such a result. The combination of these talents means that, unlike most of the valve-based competition, it sounds comfortable pounding out Kanye West’s Power. There’s a good dose of attack here, plenty of control and a pleasing level of detail. It’s possible to buy greater transparency and openness for similar money. Bryston’s 4B SST2 will give that, as will Cyrus’s excellent Mono X300, but both are transistor-based – and sound it, by placing greater emphasis on precision and agility. Valve alternatives such as Audio Research’s VS115 and the hybrid Aesthetix Atlas are great performers and provide stern competition for the Quad. In absolute terms they are arguably more capable and insightful, too. But to dwell on this would be missing the point of the Quad II-eighty. It’s a power amplifier for those who cherish Quad’s past and want a taste of it without buying equipment that’s decades old. There’s enough modern engineering here to really satisfy when it comes to sound quality, yet this power amplifier gives a real feel of the classic equipment it’s based on. Imagine being able to buy a brand new Jaguar E-type that’s built and engineered to modern standards. That’s what this Quad monobloc offers: a flavour of the past with the security of the present. 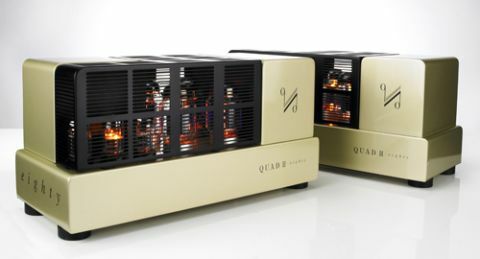 The Quad II-eighty was tested alongside the QC-twenty four preamp.